My wife and I just came back from dropping our eldest son, Timothy, off at college. Yup, some 6,570 plus days after he came into this world, we are in retrospect, letting him free. I have been trying to prepare myself for this inevitability for the better part of five months, right about when he submitted his letter of intent to W.P.I. I think I did just fine, until we drove away after saying goodbye. My eyes welled up as we turned off of Institute drive. I took a deep breath and then 18 years of memories came flashing at me as if each event was happening again, right now. I know tonight is going to be a tough night, albeit a good tough, but tough nonetheless. I can remember vividly him coming into this world. I was twenty years old. I was young, naive, scared. The hospital gave him this really cool hand knitted green hat. I remember him taking his first steps to me from our couch from our second floor apartment.We actually have a picture of that somewhere. I remember his first Christmas, just a month old, Dale bringing him down to me dressed in a surprise Santa outfit. Fast forward a couple of years watching him fit in the bottom storage of our Entertainment system which remarkably we still have today, or carrying him on my shoulders all the way up Eagle Rock in West, Virginia. I remember the spur of the moment trip when I picked him up at Daycare when he was five and bringing him to his first Red Sox game, buying tickets at the gate. We have had so many fantastic times: like dressing all in blue rooting for the Colts the year they made it to the Superbowl and I had them in the family football pool (Note: We are huge Patriots fans) Or his first time in Disney. 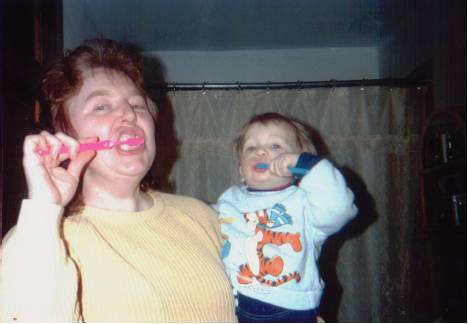 I still marvel at older pictures like watching him brush his teeth with Nana. It's hard to fathom that he was once so small. I can't help but cling to the times of helping him learn how to ride a bike, play his first football game, beat me for the first time playing basketball. I can't help but remember the day his younger brother was born, and the genuine love and kindness he showed to him. It was then that I realized that he was someone special, not because he is my son but because he is genuine. I have watched him grow from a little, innocent boy into a wonderful, caring, genuine young man. Mom and I are so very proud of you Timothy. Although, I know you are starting a new chapter in life, one that focuses on you. That is the way it should be but if you don't mind, I am going to hang on to the last 18 years for the next few days. Remember, just like I said to you tonight, "Have fun and Enjoy. Every. Minute." Can't wait to see you in November... and I just left you 3 hours ago. Well, next Tuesday, November 6th, 2012, one of two things will happen for sure: We will have a 45th President of the United States or the existing President will serve another four years. This is about all I can be sure of. Everything else might as well be the result of a flip of the coin. (No, I will NOT choose our next President by flipping a coin) Sometimes, when I look at Senate choices and most definitely local town appointments, I wonder if I would be just as well served. Although, I have a number of thoughts swirling around in my head as the inevitable day looms. I am registered as an Independent voter. An Independent is defined a voter who votes for candidates and issues, rather than on the basis of political ideology or partisanship. I have never understood the rational of voting for a straight ticket. Especially now, as I don't see the differences to be as great on a number of issues. However, this blog is not about whether one party is better then the other. I am not going to defend one Presidential candidate over the other. Rather, I am going to pose a couple thoughts that I don't think people ever consider when voting. I, like most Americans, after eight years wanted our troops to come home. This was a "buzz" topic during the last election and it centered around time lines of bringing troops home. Pretty logical. Good Sentiment. So, you get elected. You arrive at the White House looking to tackle this agenda item. They bring in a box of files, pertaining to where "we" are in Iraq. You start looking over the files. As your keep reading, there are so many "items" you weren't privy too. Some of your predecessor's choices make a whole lot more sense now. It's not conceivable in our current state to withdraw troops without considerably hindering other objectives which have been intertwined over time. You are running and you say, "I can cut this deficit in half in the next eight years." Sounds great. We should have never offered all these bailouts and the stimulus money was done wastefully. You are in office and then you hear that the money was put where it was, and the companies saved because of the nature of the house of cards. You pull the wrong one out and we would have seen something much more catastrophic then the Great Depression. What I am trying to convey, is we can all promise you anything you want. Sometimes, we may even genuinely believe it 100%. Intentions as a whole are usually for the greater good. However, when we get to a place where the decision is ours and the result lays only with ones self, the weight of the world looms large not just figuratively, but with a Presidential election, literally. Before you mark that X next to a name or color in that scan tron circle, think to yourself what would I do if I was President? No Rhetoric because what you say affects 300+ Million people every time you open your mouth. This will be the most difficult thing you will ever encounter. You live in a fish bowl. You become the World's target: You're too soft, you're too hard. I got news for you, not every one's going to agree with you. You're check box could change the world. But after all, it's your civic duty, right? So, I woke up earlier this week and my gums were really red. Didn't think much of it cause sometimes it happens. I just gargled with some warm salt water and went on about my day. Well, the next day I had a bump. So, more warm salt water. It proceeded to get bigger and by Day 4 I called my dentist. I had an abscess. I didn't feel the normal pain as it was on a tooth that I had already had a root canal on and a crown nine years earlier. My biggest fear is Death. However, losing my teeth is a close second. So, I am down one 6 year molar. It took two full days for the bleeding to stop. Nothing like drooling like a mad man with guaze stuffed in my mouth. Yes, it has no asthetic value but dammit, I don't want to lose my teeth. So, I have investigated about getting an implant. My biggest concern is my other molar will absorb all the pressure and it will be next, seeing it already has a crown due to my excessive, incessant grinding at night. Well, implants are kind of expensive. Basically it's going to cost me around $4500 to replace it, including the extraction which I already paid for. That is a lot of money for a tooth but it's my main molar. Sheesh! There's always something. Also, this week, my oldest had his four wisdom teeth out. Originally, I was going to keep mine and put it under the pillow to see how much I would get but my middle child would seriously consider yanking all of his teeth out, so we scrapped that idea. But 5 teeth in one week in my house. Wowzers! So, you think your a coach? This is more of a tirade then anything. Sorry, but I need to vent. My middle son plays AAU basketball. Before I go into it, I am going to say that AAU is not what it was when I was a kid. I won't deny there was a little politicking of Dad's who knew Dad's. And then there are coaches who pick athleticism over fundamentalists, hard working and coach-able kids. Heck, that still happens these days. What really bother's me is when coaches bark out commands and expect kids to get it. "Screen away from the ball." "When you get in the post, drop step, seal the defender off." "After you pass, cut and then back out." "Make sure you box out." "When you get the ball, get in the triple threat position." "Use the baseline." "Make sure to yell Help if you get beat." "Make sure you set a pick for your teammate with the ball and roll off." "When your in zone and the ball is here, you need to be here." These are all legitimate statements. Kids should learn how to do these things. These all have great purpose. However, they are yelled out without showing the kids why they should be doing this. They run here, and then they run there. They ask for the ball way out at the 3 point line, which none of them can make unless they heave it like a baseball. It absolutely aggravates me the ignorance and arrogance these guys have. I was at a practice tonight where they told the kids to screen off the ball. This is done to create movement, to help get other teammates open. Screen off the ball? They can't even run a simple pick. If the kid makes the pick right, the ball handler doesn't wait for the pick to get in place. Why? Because he doesn't understand the kid is creating a "roadblock." I asked my son tonight, do you know what a drop step is? Not that he should because he's always playing point but just the same, he's like no. Well, thanks coach for explaining it. These kids are at the age where they learn by doing and understanding. Once a kid knows why he is throwing a pick or why he needs to keep the triple threat (Ability to pass, shoot and dribble) available and sees it work, they will trust it and do it more often. Oh, and if you show a kid to box out and little Johnny can see that he can box out Benny who is 30 pounds more then him, it will create confidence and be willing to do it. Just because you can shoot a ball, doesn't mean you can coach. I have decided to take a little time off from Facebook. The last couple of weeks, I have noticed I waste an inordinate amount of time on this social media site. Every night I come home, eat dinner, play a game with my youngest and onward to my little I-pad to play Words with Friends. As I watch TV, and wait for my fellow WWF play their words, I hop onto Facebook, looking for replies to messages, updates to posted comments and thinking of witty comments to post as my status. Yes, it's all really sad. My wife and I play a game of virtual scrabble every night from across the room. This is a bit odd, seeing we own the REAL thing. Okay, I digress, this post was about going on a Facebook sabbatical. I have, well, I don't know how many friends I have (that would require that I go onto Facebook) but the reality is, I check the same 4 or 5 people all the time. And well, they're people I actually call to hang out with anyway. I have said all along that Facebook needs to have a cut and dry way of grouping people, such as acquaintances, friends, family, and colleagues. I have heard that there is a round-about way to do this. Although, I know there are some people that might take offense to how they are grouped, so it's just a little too late for that. I know I have and that's just stupid. I shouldn't care but it makes me think of elementary school. That in itself is enough to commit my self to a local psychiatric ward. I'll always have a self-esteem problem, just the way I am wired. Not to mention, I don't need to know what people had for breakfast, lunch or dinner or what their daily routine is. Are they expecting I might drop by? Well, then why don't they just ask. Also, I have gotten to the point that I actually think about what I am going to post sometimes, and who might see it... that's just a RED flag. Another bone I have with Facebook is how they get you to unknowingly allow anyone to see or use your data. Ever try to do one of those questions or apps? In fine print it gives the party who created o sponsored it to have access to your data. Also, I don't know how many laptops I have fixed because they have been infested with Malware, seriously slowing down and degrading the performance of your machine. Finally, Facebook has become just another place that people can talk about anything without having to really confront whoever they are talking about or too. Not to mention, words can never have the proper inflection in tone. What's even worse, as someone I know posted, "You can say no to someone or completely ignore them without having the awkward feeling." Just another cop out in my mind. I do think there are some great uses of Facebook such as creating a page which promotes activities for people to attend without feeling pressured. It also is a great way to get your word out. Although, if you use a platform like Facebook to solicit donations for some cause, would you call these people? For now, I am going to spend time with the people that I see everyday and Facebook is just going to have wait its turn. ...is what I wish I was right now.